Do you ever feel like there isn’t enough time in the day to finish your loads of laundry? 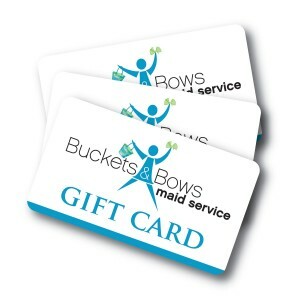 At Buckets & Bows we know how important saving time is when doing household cleaning. Avoid spending countless hours in the laundry room and put these 7 helpful tricks to work. finished, run another spin cycle. This will extract even more water so your dryer won’t have to work as long. If you have a front loader, send the clothes through the drain and spin cycle on the highest setting. Don’t forget to vent. In addition to the lint filter, be sure your exhaust vent is clean. If your dryer isn’t adequately vented, it has to work harder and longer. Plus, a clogged vent can cause lint and dust to catch fire. Follow the rule of succession. Toss loads in back to back to capitalize on residual heat. Load size matters. Stuffing the dryer to capacity doesn’t allow the wet load to tumble so the hot air can do its job. On the other hand, dry too few items and they’ll simply cling to the dryer drum rather than tumble. Birds of a feather dry together. Mixing too many heavy pieces, like towels, with lighter items, like undergarments, will prevent the lighter ones from drying. Towel trick. Add a dry towel to your wet load to help absorb the dampness. Sensors rock. If your dryer has a sensor dry setting, use it. It will detect when your clothes are dry and time the cycle precisely. Excellent suggestions. It’ amazing how many of these are taken for granted with a hectic rushed lifestyle. These will certainly make laundry tasks finish quicker and more cost effective. Rachel at Buckets & Bows is great. She is our tech where I work just down the street at Truly Nolen.